Suzie Baker, "Harvey was Here," oil, 16 x 16 in. The Laguna Plein Air Painters Association (LPAPA in Residence at Forest & Ocean Gallery, Laguna, California) hosted the opening reception for the “14th Annual “Best of Plein Air” juried art show on Saturday, July 14. Guests sipped wine and enjoyed nibbling on an array of artisan cheeses, fruits, and sweets as they anxiously awaited the announcement of the five award-winning artists. 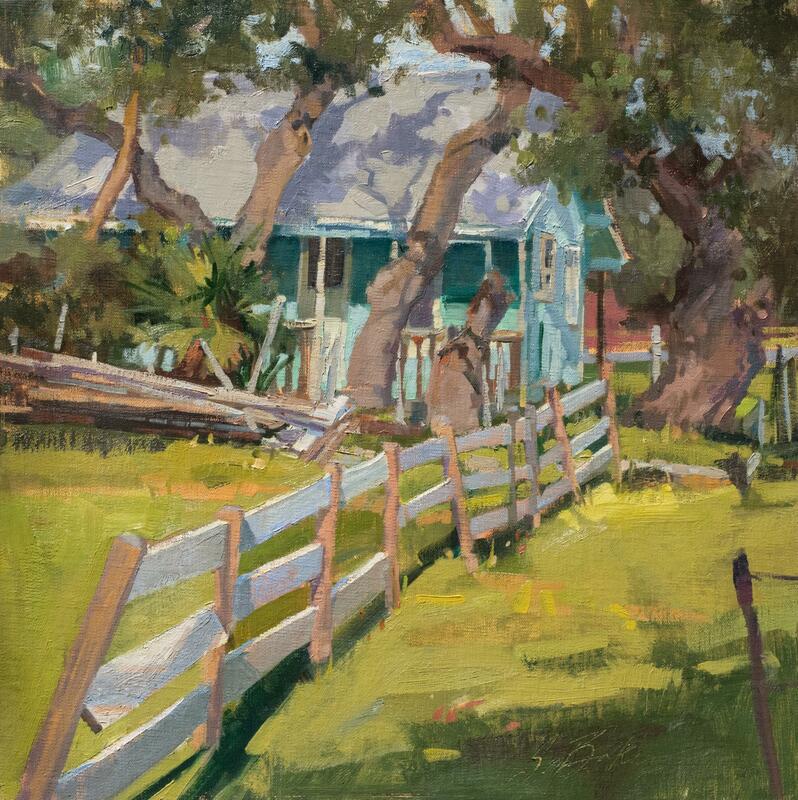 LPAPA’s 14th Annual “Best of Plein Air” exhibition “is a special juried exhibition of original works of art created by Signature and Artist Members of LPAPA. 400 entries were received for this prestigious show with jurors Cynthia Britain (Signature and Founding Member of LPAPA), Carl Bretzke (LPAPA Signature Artist), and Ludo Leideritz (owner Forest & Ocean Gallery) choosing more than 60 original framed paintings for the show’s coveted spots. Durre Waseem, “On the Crystal Cove Bench,” oil, 11 x 14 in. Bob Upton, “The Breakwater,” oil, 6 x 12 in. Greg LaRock, “All Quiet Now,” oil, 9 x 12 in. Tatyana Fogarty, “Monterey Fishing,” oil, 11 x 14 in. The Laguna Plein Air Painters Association was founded in 1996 with a mission to preserve Laguna Beach’s rich artistic legacy founded by early plein air artists and to promote the tradition of plein air painting in our community, across the nation, and around the world. LPAPA is one of the best recognized and most respected plein air art associations in the world with a growing roster of more than 600 local, national, and international artist members. In addition to providing opportunities for established and emerging artists to show their work, LPAPA has a strong commitment to education utilizing their Plein Air Project to benefit young and emerging artists and the greater community.